Synopsis: Weird as it is working for the International Paranormal Containment Agency, Evie’s always thought of herself as normal. Sure, her best friend is a mermaid, her ex-boyfriend is a faerie, she's falling for a shape-shifter, and she's the only person who can see through paranormals' glamours, but still. Normal. There are some books that people rave about and you really have to wonder what the fuss is about. 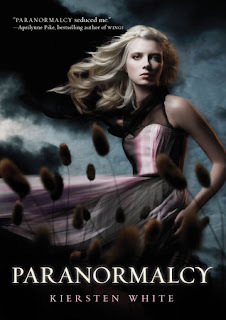 Paranormalcy was one of those books for me. How good could it be? Well, as good as everyone says it is! I really, really enjoyed this book. Evie is sweet and naïve and innocent, despite the fact that she sees a lot of pretty freaky things. Her life is very sheltered and she just desperately wants to be normal and have the things that most teenagers take for granted. I love all the different creatures in this book, and the different take on them – vampires, werewolves, faeries, mermaids, hags, you name it. There are so many paranormal books out, and so many of them are the same, that I love when there's a different spin on them. Lend, the boy Evie falls for, is one of those characters that proves the theory that boys are better in books. Talk about the perfect boy! *WARNING: POSSIBLE SPOILER ALERT* I was so sure that Lend was going to end up being bad. When he and Evie were hanging out and Evie was telling him all about herself, her job, and different things about IPCA, I kept thinking ‘stop telling him all these things, he’ll use them against you! Don’t say the faerie’s names in front of him, he’ll use them!’ He just seemed too good to be true and I was definitely glad when he ended up being really just that amazing. I actually found myself crushing on Reth too, despite the fact that Evie sees him as so horrible, and he does do a few things that make him a little sketchy. I just have a thing about faeries, and I loved the way he talked and his old-fashioned nature - I could totally picture him and hear him in my head. And what I pictured was pretty yummy lol. I also really enjoyed the intrigue in the book. Wondering what Evie was, who/what was killing paranormals, who/what Fire Girl was, why Reth was so intent on Evie, all those things made for a really interesting story. My only complaint, and it’s a minor one compared to how awesome this book was: the ending was a bit abrupt, and I kind of wanted a little more in terms of the story with Fire Girl. Other than that, I loved this book, and I can't wait to read book #2, Supernaturally. I loved this book too. I still can't figure out why I haven't gotten the second one yet. Hum. I have a problem where i usually read the first book in a series, and then as much as I want to read the second I never buy it. I will with this one though. I love Lend he's one of the few male characters I love in books. I like a lot of them, but love him. I wanna be able to see Evie in a normal surrounding seeing her go crazy over random things was cute. Anyways, loved the review.